In the 1950s, costume jewelry enjoyed a global boom in popularity. Jewelry designs were clean, colorful, ornate, and coordinated to an outfit perfectly. Costume jewelry flourished with increased spending power that this decade yielded. 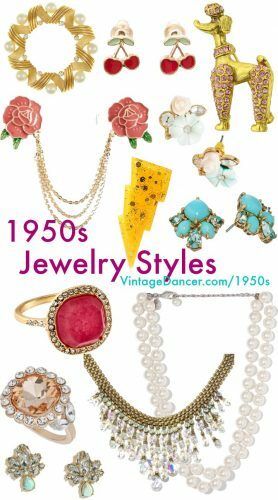 Consequently, 1950s costume jewelry perfectly facilitated the trend for women to look well groomed. While the war years brought about austerity, the new decade was a very welcome change. Especially relevant was the launch of Dior’s Corolle collection in 1947. Dior’s version of idealized femininity was characterized by a defined waistline and full flowing skirts. This silhouette was to dominate the following decade, becoming the archetypal image of the 1950s woman. This idealism saturated all aspects of women’s lives during this era, even into the realm of their closets and jewelry boxes. Novelty designs and patriotic colors were still common but were being replaced by classic vintage jewelry shapes and colors. Expanding on the desire for women to appear considered and coordinated, women wore matching sets of jewelry. A set of jewelry pieces designed to be worn together is called a parure. Women wore matching earrings, brooches, rings, necklaces and sometimes bracelets. “Choose very carefully a few costume ornaments such as earrings, a necklet and bracelet. If you keep them all to say, gilt in winter and white beads in summer, you will never look wrongly trimmed.” – July, 1954 Woman’s Weekly. Pearls had been a popular choice of jewelry for the past few decades. However, in the 1950s, pearls suddenly enjoyed a boom in popularity. They were the perfect accessory for the little black dress. Black and white were very chic. So were other colors of pearls: champagne, coffee, lemon yellow, cream, and grey that complimented a woman’s complexion and outfit. Stand lengths were usually very short so they could be seen above a modest neckline but could also be very long such as the waist length necklace trend in the mid-1950s. They looked especially smart with tailored suits, afternoon frocks, twin sweater sets and cigarette pants. A single pearl stud earring and a single or double strand pearl necklace was the required day wear for most outfits. Drop pearl earrings were an option for women with pierced ears however most women used clip on or screw back earrings. “Each summer there is one special fashion for neckwear in the way of jewelry. This year it is the mass of white beads. Find, beg, or borrow every strand you can, whatever their size. Put them all together in what appears to be a tangled mass. The effect will be stunningly smart! – May, 1954, Woman’s Weekly. Grace Kelly was frequently pictured wearing pearls, and subsequently was a fan of the jewelry style. Jewelry featuring pearls was raised to iconic status as a result of this endorsement. For decades wearing flashy jewelry in the daytime was seen as vulgar. In the 50s wearing jewelry during the day was not only encouraged in ads and Hollywood star sponsorships but also in clothing design. Twin set sweaters and long sleeve shirts ended at “bracelet length” so that a chunky or glittering bracelet could be seen and not buried under bunches sleeves. Women’s suits had deep chest pockets, ready to frame a cluster of brooches. Open necklines also invited bib necklaces and layers of beads to shine against the skin. Many fashion designers didn’t wait for a shopper to buy jewelry separately, they built it in. Rhinestones were stitched onto dresses, accented belts, or embellished collars. Pearls were beaded onto hats, chignon hair wraps and purses. Nothing was left alone. Every outfit called for some dazzling jewelry. Women powdered their eyelids in bright azure blues and painted their lips in clear corals in the mid 50s. Consequently, this trend filtered through to costume jewels. Bolder colors began to grow in popularity in the 50s steering away from primary hues and into soft pastels, saturated tropicals, and shiny metals. Red was the one primary color to survive into the 50s. Red beads, bangles, belts, and earrings accessorized summer clothing boldly. Faux turquoise and coral stones were the two new colors, revived from the 1920s. A smooth round or oval cabochon cut was utilized to create the turquoise stone, therefore making the stones appear as genuine as possible. Real turquoise was prone to fading or dulling from contact with skins oils or direct light. These vibrant new colors looked best when matched with a woman’s dress of the same color or against white, ivory or black. Jewelry was meant to pop, to stand out and be noticed. Yet it was tastefully placed. Most women avoided jewelry with casual clothing but added one to three pieces for outing dresses, suits and evening time. The favored choice of jewelry setting during the 1950s was a yellow-toned gold. Rose-gold was also trendy, especially when set with rubies and warm color gems. As new designs emerged, various styles originated. The most noteworthy of these was textured gold. It encased colored jewelry throughout the decade. In the later years, it was rich enough to be worn on its own. Gold button earrings, gold flowers and leaf necklaces, gold cuff bracelets and gold figure brooches were large but simple. Gold chain bracelets and necklaces were very fashionable in the late 50s. Heavy, layered and miss matched was the emerging bohemian look. Lucite is a type of plastic made from acrylic resin developed in the 1930s. During WII, military aircrafts used Lucite as an important component. After WWII stocks of Lucite were no longer needed, therefore accessory and jewelry designers utilized the material instead. is another vintage plastic used heavily in the 1940s and some in the 1950s. Bakelite’s color was flat while Lucite had a clear, translucent appearance. This created a lighter almost glass or diamond-like appearance that fit better into the 50s use of pastels. One such jewelry design was the Jelly Belly pin. Designed by Trifari, Lucite was crafted into smooth cabochon balls in order to form the ‘belly’ part of a design. The brooches were formed of gold-plated metal and trimmed with rhinestones. They were quite small and looked best worn in clusters of two or three, called scatter pins. Animal shapes such as frogs, seals, poodle, ducks, and roosters made of the bulk or genuine Jelly Belly pins. These pins quickly became hugely popular. Today, prices for original Trifari Jelly Bellies can command vast sums. This brooch from Charming Charlie is a new version of the 1950s Jelly Belly pins. The vogue for glittering, sparkling jewels has never faded. However, in the 1950s, this trend reached new heights. During WII, rhinestones were difficult to obtain due to metal shortages. By the 1950s, rhinestones were once again readily available and highly desirable. They decorated clothing, hats and handbags and provide evening dresses with the perfect touch of sparkle. Evening jewelry could be a simple single or double strand rhinestone necklace or a more dramatic bib rhinestone necklace for gowns with plunging necklines. Many women choose to only wear large rhinestone earrings or a brooch with their cocktail attire. Small cut crystals were a more expensive alternative to rhinestones. They glittered brighter and came in much larger bib collar and teardrop shaped necklaces with matching earrings and cuff bracelets. If a woman couldn’t afford crystal or rhinestone, pearls were her best choice. They transitioned from day to night beautifully growing larger into the evening styles. Multi-row chokers, layered pearls, and pearls mixed with stones created elegant evening jewelry. By the mid 1950s, a new type of sparkle burst onto the scene. Christian Dior in collaboration with Swarovski had developed the Aurora Borealis stone. This glass gem sparkled iridescently, creating a visually mesmerizing rainbow effect. Simultaneously, fashion houses were realizing the potential of costume jewelry to complement their designs. Chanel and Schiaparelli had been releasing their own jewelry designs for years. By the latter half of the decade, many more fashion houses all had their own in-house jewelry designs. As costume jewelry grew in size, the trend for cocktail jewelry emerged. Cocktail rings also called knuckle-dusters were designed to be oversized, statement pieces. Women wore the rings for evening soirées, and of course cocktail parties. They were made of large fake diamonds and translucent stones that reflected light. There were also cocktail rings made of clusters of rhinestones, pearls, and colored gems. Most were round but some designers shaped them into snake like lines, atomic stars, sunbursts and geometric bands. The modernist movement combined metal and bakelite or lucite into cocktail rings that were especially popular with the youth. Some of these took on Art Deco shapes and colors, reviving this recently past style once again. Cocktail rings had several names to describe the shape or design. Bombe rings were dotted with colorful gemstones. Wired rings created a nest topped by a large gemstone. Ballerina rings featured all over sparkling gemstones. Bypass rings were oversized with very large gems. The company Trifari was officially founded in 1925. Founder Gustavo Trifari had been making jewelry since the early 1900s. From the 1930s onwards, the brand created a vast amount of costume jewelry. Trifari created jewelry both for musicals on Broadway and department stores. Consequently, the company was one of the largest manufacturers of American costume jewelry (the other being Coro). A Trifari jewelry advert from the 1950s. By the 1950s, the United Kingdom was also distributing Trifari pieces. Indeed, the company produced its ‘Coronation Gems’ series to mark the coronation of Elizabeth II. It was well known for the Trifari Crown pins designed by chief jeweler Alfred Philippe. Some were brightly colored cabochons while others were made of crystal rhinestones for eveningwear. A famous American lady, Mamie Eisenhower wore Trifari costume jewelry to both her inaugural balls. She wore a faux rhinestone and pearl choker necklace with matching three-stranded bracelet and earrings in 1953. She was the first to wear costume jewelry at an inaugural ball. Similar to Trifari, Coro produced costume jewelry mostly for the movie industry. By the 1950s, the company produced sets of jewelry in pressed glass and plastics. Flowers and floral designs were a source of inspiration from the Victorian era. They were usually formed of colored metal, gold and sometimes plastics and enamels. Roses, daisies, sunflowers, orchids, tulips and poppies were some of the favored flowers. The Corocraft lines were sold in department stores, catalogs and specialty shops are affordable price points. Vendome was the top of the Coro craft line. It was well known for designing rhinestone studded chokers and silver plated colored stone bangles. It also designed high end faceted bead necklaces, delicate flowers strands, and pearls specifically for brides. Founded in 1949 by Charles Stuart, Sarah Coventry was named after his granddaughter’s first name and the town of Coventry in England—where the Stuart family had emigrated from. Sarah Coventry did not have an in-house designer, instead, Stuart purchased designs from freelancers, then hired manufactures to create its chokers, necklaces, brooches, watches, earrings, and bracelets. The designs were similar to some of the mass labels with cabochons and marquise-cut rhinestones on geometric shapes, flowers, bows, medallions and stars. Novelty shapes like angels at Christmas time and pineapples in summer kept the selection fresh. What makes the Sarah Coventry brand unique was not the designs but the marketing plan. Instead of hiring Hollywood Stars to wear the jewelry or buy space at department stores jewelry counters, housewives became independent sales representatives and held house parties to showcase the latest collections. They were one of the first home party marketing firms, similar to what Avon was for beauty products. The selling model was a success. Women wanted ways to earn extra money, buy pretty and cheap costume jewelry and have an excuse to socialize with friends. While party shows in the 50s were slow to build by the 60s and 70s almost every woman had a Sarah Coventry rep. Towards the end of the decade, pierced ears started to become socially acceptable again. This allowed women to wear longer lengths of earrings in denser designs. Hoop earrings became popular. Women wore hooped earrings of various colors and textures to match their outfits and especially headbands and hair scarves. Hoop earrings show off short 1950s hairstyles well. Twinsets and cardigans became popular due to the rise of ready to-wear-clothing. Factories were producing many designs, in a varied selection of hues. It became fashionable to wear a sweater or cardigan draped across the shoulders. Sometimes women tied the cardigan sleeves to keep it in place. However, this could prove uncomfortable. Sweater guards and cardigan clips were the perfect answer. “We had sweater clasps: two fancy alligator clips connected by a chain or string of pearls. We wore them to hold our sweaters over our shoulders without putting our arms in the sleeves.” – Michele B., What We Wore. If you were a child or teen in the 1950s when you must have owned some Pop-Its / Pop Its / Popits. Also called Snap beads or Snap-it beads, they were colorful hollow plastic beads that popped into each other making the combination of colors endless. At first, the colors were fashionable for women- gold, turquoise, pearl, red and pastels shades. The idea was that they were more affordable than real pearls (only $1-2) yet looked nicer than cheap plastic dime store pearls. When children adopted the fashion, primary colors such as bubble gum pink or sunshine yellow were sold as well as mixed bags. All together they formed a 60 inch necklace which was long enough to wrap around several times for a layered look or taken down to a short 10 inch choker necklace. Smaller sets for choker length necklaces also came with matching earrings. Pop-Its were a worldwide phenomenon. In America, Lucite manufactures made them in translucent materials. Name brands Coro and Richelieu made quality Pop-Its. In Hong Kong they made celluloid pop beads with small beads inside larger beads and tiny beads covering the outside. The beads ranged from 1/4 to 1/2 inches in diameter. Gold or silver connectors were also sold in a disc shape. They added elegance to these otherwise playful toys. Bold Clear Colors – Imitation turquoise and coral stones were popular, mimicking the fashions in make-up design. Textured Gold – Costume jewelry featured yellow toned gold with a textural surface. Cocktail Jewels – Women wore statement cocktail rings for evening occasions. Pearls – Women wore pearls high at the décolletage. Parures – Women wanted to appear coordinated at all times. Women wore matching sets of jewelry. Hi, I am curious about the 1950s Evening Jewelry. I actually have the set #21 that you have pictured in the collage with the 3 other sets. I have the earrings, bracelet and the necklace in there original box. The box is some sort of gold-ish plastic box with a rose design embossed on the top. Can you tell me anything about the set? I bought the set at an antique store. The owner said she purchased it at an estate sale and did not know anything about the set. I am curious and would like to find out more information. The set is beautiful. This was a great read with lots of really good info. Thank you for bringing this to us. They weren’t called pop it beads. They were just called pop beads. I have seen references for both. I believe “Pop-it” was a name brand for some pop beads. Maybe it’s a regional thing, but in the Midwest, we called them all ‘pop-it’ beads, regardless of who made them.